Uncover the ancient secrets of Egypt long buried in desert sands while experiencing the welcoming culture of today. 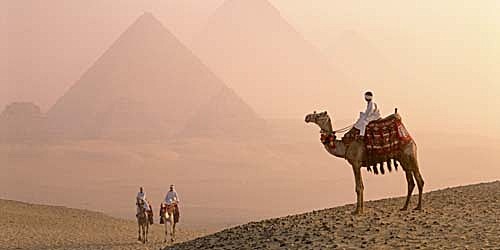 See the pyramids from astride a majestic camel. Wander among 140 soaring pillars in Karnak Temple. Explore Dendera, one of Egypt's best-preserved and less-frequented temples. Feel the Nile breeze on your cheeks as you skim its waters by traditional felucca. Delight in the fragrances of Aswan’s spice market. Join Viking and our expert Egyptologists on a 12-day Nile cruisetour into the heart of Egypt. Owned and operated by Viking, Viking Ra is the newest, most upscale ship in Egypt. Specifically built to navigate the Nile, in 2017 she was completely stripped down to her steel frame and reconfigured to be a modern, elegant vessel. Fully reimagined to international standards and Viking design specifications, she is now an all-suite, state-of-the art ship with the clean, elegant Scandinavian design for which Viking is known blended with local influences like traditional geometric Arabic patterns. Accommodating just 52 guests, she offers the ultimate in comfort. Unpack just once on our small, state-of-the-art ships, enjoy your spacious stateroom, and spend more time immersed in your destination. See why Viking is the world’s leader in river cruising. DESTINATION-FOCUSED DINING. Whatever your tastes, we believe dining is an important part of your journey, both on shore and on board. Our highly trained chefs are passionate about food and committed to providing an enriching culinary experience, whether you’re savoring authentic regional specialties or American classics.